Living in Central Florida, fall comes slowly. We may have a cold snap in September, but it's highly unlikely. There have been many a year that we've made it all the way to Thanksgiving without even bringing out our light jackets. So cool, icy treats are still a thing for us here. But to help make it a little more like fall, I figured I'd share some of my favorite Sorbet and Sherbet recipes using fall flavors. Sorbets are very basic. Mainly they are pureed fruit, sugar, and water. You can make them more interesting by adding fresh or dried herbs, honey, maple, or even alcohol. Alcohol also has an added benefit of helping prevent the sorbet from becoming one large block of frozen fruit, though if you freeze it on a cookie sheet, break it up, and blend it, multiple times, you can get a good consistency as well. 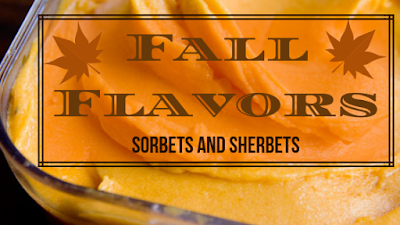 Sherbets are very similar to Sorbets, the main difference is a creamy/dairy element. Adding cream, yogurt, buttermilk, coconut milk, etc to fruit puree, sugar, and water, then freezing will give you a decent Sherbet. Hachiya Persimmons are a great fall fruit here in the South. Just make sure that you wait until they are fully ripened, almost too ripe, or they'll be to astringent to really eat. Just cut the top off and scoop out the ripe, jelly-like, insides. This makes them super easy to make sorbet with. In a pot, on the stove, combine honey and water. Bring to a boil and stir for 1 minute. Reduce heat and allow to simmer for 5-10 minutes while stirring. Remove from the heat and add in the lemon balm leaves. Cover and allow to come to room temperature. Once your persimmons are nice and soft, cut the tops off and scoop out the insides, into a blender. Add the lemon juice and strain the lemon balm syrup into the blender as well. Blend well. To make it a Sherbet instead of a Sorbet, here is where you add your milk and keep blending. If you are making this without the aid of an ice cream machine, adding alcohol will help keep it at a nice consistency. You can still make it without alcohol or an ice cream machine by freezing it on a cookie sheet, then breaking it up and blending it again several times (minimum 3 freezes to get the right consistency). If you're using an ice cream machine, just add this mixture to the machine, turn it on, and wait. This time of year you can find Pumpkin Spice flavored everything. Why not join in the fun! This makes a delicious, cool treat, for the warm fall seasons we tend to have here in Central Florida. In a pot, on the stove, combine honey and water. Bring to a boil and stir for 1 minute. Reduce heat and allow to simmer for 5-10 minutes while stirring. Remove from the heat and add in the spices. Cover and allow to come to room temperature. Put your pumpkin puree in the blender with the orange juice and syrup. Blend well. To make it a Sherbet instead of a Sorbet, here is where you add your milk and keep blending. If you are making this without the aid of an ice cream machine, adding alcohol will help keep it at a nice consistency. You can still make it without alcohol or an ice cream machine by freezing it on a cookie sheet, then breaking it up and blending it again several times (minimum 3 freezes to get the right consistency). If you're using an ice cream machine, just add this mixture to the machine, turn it on, and wait. I love figs! I grew up eating fig preserves with my toast in the mornings, dried figs on hiking trips, and fresh figs every chance I could get. So it's no surprise that this is one of my favorite homemade sorbets. Clean and quarter your figs. In a pot, on the stove, combine figs, honey, and water. Bring to a boil and stir for 1 minute. Reduce heat and allow to simmer for 10-15 minutes while stirring. Remove from the heat and add in the elderflowers. Cover and allow to come to room temperature. Add the apple cider vinegar and strain the mixture into a blender. Blend well. To make it a Sherbet instead of a Sorbet, here is where you add your milk and keep blending. If you are making this without the aid of an ice cream machine, adding alcohol will help keep it at a nice consistency. You can still make it without alcohol or an ice cream machine by freezing it on a cookie sheet, then breaking it up and blending it again several times (minimum 3 freezes to get the right consistency). If you're using an ice cream machine, just add this mixture to the machine, turn it on, and wait. Another flavor found everywhere this time of year, is apple. Apples go well with so many flavors, mint, cardamom, cinnamon, basil, and sage are just a few. Here I paired the roasted apples with sage, to give it a slightly different, yet still fall-like flavor. Feel free to use any of the herbs I listed, or one (or more) that I didn't. In a pot, on the stove, combine honey and water. Bring to a boil and stir for 1 minute. Reduce heat and allow to simmer for 5-10 minutes while stirring. Remove from the heat and add in the sage. Cover and allow to come to room temperature. While you're working on your simple syrup, clean and quarter your apples. Place them on a cookie sheet with a little butter or coconut oil and bake, at 450 degrees, for 10 minutes then place them into a blender. Add the apple cider vinegar and strain the syrup into the blender as well. Blend well. To make it a Sherbet instead of a Sorbet, here is where you add your milk and keep blending. If you are making this without the aid of an ice cream machine, adding alcohol will help keep it at a nice consistency. You can still make it without alcohol or an ice cream machine by freezing it on a cookie sheet, then breaking it up and blending it again several times (minimum 3 freezes to get the right consistency). If you're using an ice cream machine, just add this mixture to the machine, turn it on, and wait. I love how versatile cranberries can be. Even though most people only have them at Thanksgiving and/or Christmas dinner. Cranberries can be used in so many ways and combined with various fruits and herbs, they can be either sweet or savory. Here's one of my favorite ways to use cranberries during the warm winters we tend to get here in the South. Rinse your cranberries, removing any stems, dirt, or rocks that may have gotten into your batch. In a pot, on the stove, combine cranberries, honey, and water. Bring to a boil and stir for 1 minute. Reduce heat and allow to simmer for 10-15 minutes while stirring. Remove from the heat and add in the juniper berries. Cover and allow to come to room temperature. Add the orange juice and strain the mixture into a blender. Blend well. To make it a Sherbet instead of a Sorbet, here is where you add your yogurt and keep blending. If you are making this without the aid of an ice cream machine, adding alcohol will help keep it at a nice consistency. You can still make it without alcohol or an ice cream machine by freezing it on a cookie sheet, then breaking it up and blending it again several times (minimum 3 freezes to get the right consistency). If you're using an ice cream machine, just add this mixture to the machine, turn it on, and wait. I hope you enjoy making these Sorbets and Sherbets! Feel free to play around with these recipes, try different herbs and fruit, make lots of icy desserts! If you have any questions or comments, please leave them below!